One of the things that I started around exam time was this tank top. 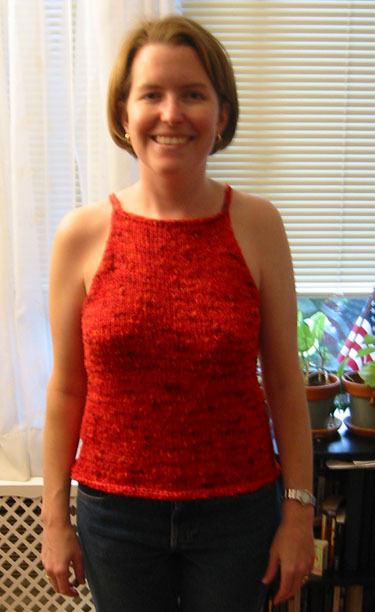 As you might recall, I started a tank top with Waikiki yarn from Crystal Palace, but it was a disaster. I shoved it to the back of my stash, and decided I would wait for inspiration before frogging the whole thing. I got it. I had put my name on the waiting list at the New York Public Library for the Yarn Girls' Guide to Simple Knits, and when it came in I found a super cute pattern for a tank top. The pattern is called "Summer in the City", for those following along at home! My LYS is actually owned by these very same Yarn Girls, so I went to their website to see if they had a page with information about the pattern. They did, and on it was a list of subsitute yarns -- including Waikiki! I chose Mille Filli Fine in red as the other yarn. I'm really, really pleased with how it turned out. It called for crocheted edging which means that I had to learn the single crochet stitch, which was fun. The way that the shoulders were joined was cool, too. 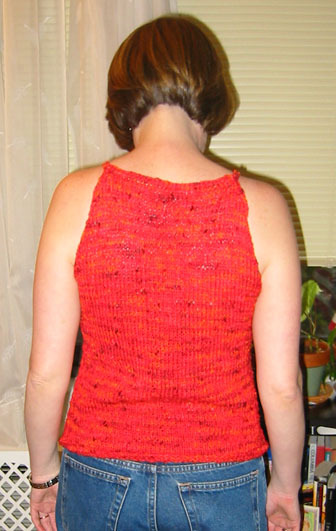 The pattern called for starting the crocheted edging at the underarm, and upon reaching the top of the arm hole doing 15 chain stitches and then picking up the back piece and starting the single-crochet edging again. The only deviation from the pattern was that I went back and added another connecting strap because I didn't think one strap looked hearty enough to keep the whole thing together! The color is truer on the pictue of the front, this one is a little washed out by the flash. You'll also note the slight curvature of my lower spine -- see how my right shoulder is a little lower than my left? Scoliosis, baby! Hi! I love your tank made in red. Red is my favorite color for tops. I made the same tank from the Yarn Girls but I used Classic Elite Sand in blue (#6457). It looks fantastic and only took me about a week to put together. I wore it for the first time on Monday, so I was really phyched to show it off to my knitting group at work. They LOVED it! BTW, I made it with a really chunky cable in the front (12 stitches!!!). I made the back in S and the front in M to add some stitches for the cable. I knew it would be a little on the stretchy side so I didn't need to add on the full number of stitches required for the cable. Try it you'll love it, too.